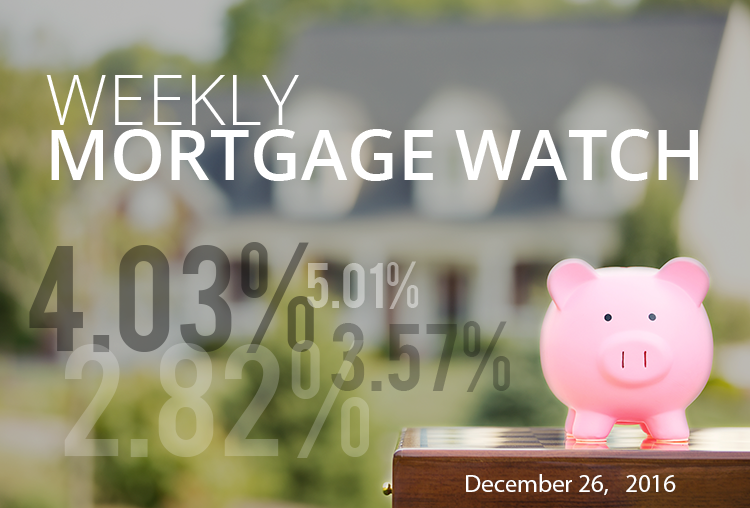 Mortgage rates finally calmed as we headed into the holiday weekend, and we are now poised to end 2016 with little chance of any significant decrease. The final estimate of 3rd quarter GDP was adjusted upward to 3.5%, both New and Existing Home sales bested estimates, and the core PCE Price Index increased slightly, as expected. While we have seen some cooling in the 4th quarter, experts believe that GDP is running at a 2.6% clip. All told, with an improving economy, the Fed once again predicting about three interest rate increases, and the markets’ general enthusiasm, we may have seen the last of the 30-year fixed-rates below 4.0% until the next economic downturn. Of course, we’ve had many recent years where growth was sub-par and rates trended back downward. The only significant economic data point due this week is Consumer Confidence. If we see another bump upward, we could see rates moving slightly upward on the news. However, given historic trends and the holiday week, mortgage rates are very likely to remain mostly flat for the week. According to data from the US Census Bureau, Utah is the fastest growing state. From July 2015 to July 2016 the state grew 2%. For the last four years, North Dakota has been the fastest growing state, but fell out of the top ten as energy prices sapped its growth from 2.3% to only 0.1%. Overall, the US population grew 0.7% to 323.1 million. Rounding out the top five fastest growing states are Nevada (2.0%), Idaho (1.8%), Florida (1.8%) and Washington (1.8%).